The Oregon Legislative Assembly passed into law House Bill 2661, which provides consumer protection to older adults, adults with disabilities, and their families as they seek out long-term care facilities. This act authorizes the Department of Human Services to register long-term care referral agents operating in Oregon. In addition to being registered, referral agents must meet operating and disclosure requirements for which there are civil penalties for violations. For updates, please refer to the “Latest News” section of the Aging and People with Disabilities program website and follow the Aging and People with Disabilities program on Facebook and Twitter. For questions, send an email to: LTCR.info@state.or.us. What does HB 2661 do? 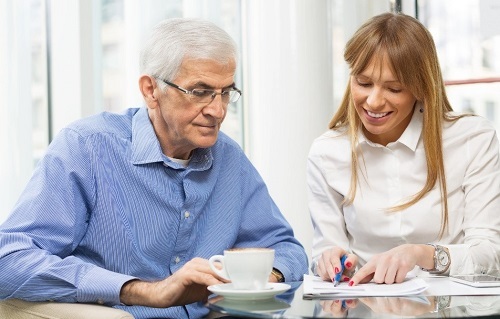 What is a long-term care referral? What if I don’t want to be contacted by a referral agent? What must a referral agent disclose to a client? How do I know a referral agent is registered? What if I want to discontinue working with my current referral agent? What if I have a complaint regarding the referral agent I was working with? Who must register as a referral agent? I’m an employee of a referral agent, do I need to register? I am a referral agent that uses contractors to do referrals, who needs to register? How do I register as a referral agent? How long does it take to receive my registration? I’ve already been working as a referral agent, do I have to stop until I’m registered? I make referrals but the client pays me for my services, do I need to register? What practices must referral agents no longer do? What are the new registration fees? What penalties could be applied for a violation of rules? Who must receive a background check? Can I use my own vendor to do a background check on me and my employees? What is a Qualified Entry Designee (QED)? I got in trouble in the past, will that affect my background check? Is there a fee for background checks? How will I know if I passed the background check? I was just hired; do I have to wait until my background is complete before working? HB 2661, passed in 2017, provides consumer protection by adding initial regulation to the long-term care referral industry. Referral agents who receive more than $1,000 in compensation, including gifts, from a long-term care facility to which they send clients, are required to register and abide by rules to do business in Oregon. A facility or employees unless they receive separate compensation for the referral. A public body as defined in ORS 174.109. A referral to facility for a client, for which the referral agent receives compensation of any kind worth $1,000 or more from the long-term care facility. HB 2661 requires referral agents to have background checks prior to having direct contact with clients. In addition, a referral agent may not share or sell a client’s placement information to a facility or marketing affiliate without obtaining affirmative consent from the client for each instance of sharing or selling this information. What do I do if I don’t want to be contacted by a referral agent? Oregon law requires that if a client contacts a referral agent, in writing, and states that the client no longer wishes to be contacted, the referral agent may not contact that client again. A statement of whether the referral fees for the long-term care referral will be paid to the referral agent by the facility. How do I know if a referral agent is registered? If a client is referred to a facility and the referral agent has received compensation from the facility for the referral, the client may notify the referral agent in writing that the client wishes to use the services of another referral agent in the future for referral to another facility. This is different from not wanting to be contacted. If the original referral agent has a contract with the subsequent facility the client is moving into, they could still receive compensation even though the client used another referral agent. It takes written notice from the client to ensure that the original referral agent would not receive compensation rather the new referral agent would, if that is what the client wishes. There are two groups who need to register. The first are those intending to receive compensation from facilities for making referrals. They work full or part time with the intent of receiving compensation for their efforts. This group would need to register prior to making any referrals. The second group involves people who do other work but also make referrals, and when doing so, over the course of a year earn more than $1,000 in cash, gifts, or other items of cash value that when added together equal or exceed $1,000. This does not include their compensation from their primary job. Items they receive from the facility, even if only meant as a “thank you” would be considered. Once the $1,000 amount has been reached, this person has 30 days to register as a referral agent. No, ORS 443.373 (1) states. A person may not provide a long-term care referral unless the person is registered with the Department of Human Services under this section. Person in this case means an individual, corporation, association, firm, partnership, limited liability company, and joint stock company as well as any other entity defined in ORS 174.100. In this case, the referral agent would submit one application for registration for the entity, not for each employee providing referral services. Those employees would however be required to submit to the background check requirements if they have direct contact with clients or their placement information. In this situation, both the referral agent AND the independent contractor both would have to register as referral agents. Each would also have to ensure that any employees providing referral services and having direct contact with clients would submit to the background check requirements. A registration is valid for two years. To continue business, the registration must be renewed every two years. Once the online application, required materials, and fee have been submitted, the Department of Human Services has 10 days to notify the applicant that the application has been accepted. The Department then has 60 days to issue a registration from the date of the Notice of Application Acceptance. If for some reason the application is incomplete or there is an error or issue that needs addressing, the Department will notify the applicant, who will have 30 days to correct the issue, unless more time is requested and approved through the Department. Application and background checks will be submitted immediately. HB 2661 applies only to referral agents who are paid by the facilities that receive the referral. If any compensation comes from a facility to a referral agent from that, that referral agent would have to register. If a referral agent only receives compensation from the client, then no, the referral agent would not be required to register. Are there practices that referral agents can no longer do? New registration fees are $750. Renewal fees are $500.Each new registration or renewal are valid for two years. There are no fees for background checks that are provided through the DHS/OHA Background Check Unit. The department may impose a civil penalty for failing to register or a violation of the rules contained within OAR 411-058-0000 through 0200. The Department will be developing an administrative rule for civil penalties during the fall of 2018. Denial, suspension, revocation, or refusal to renew registration. Referral agents, or employees of referral agents who provide referral services and have direct contact with clients or their information are required to pass a background check. Referral agents wishing to use a private vendor must obtain prior authorization from the Department of Human Services as described in OAR 411-058-0080 (6). What is a Qualified Entity Designee (QED)? A Qualified Entity Designee (QED) is the referral agent or an employee that will be authorized to enter applicant information into the BCU database and request background checks. When a referral agent applies for registration, they will receive an email with directions to follow to obtain training that will allow this referral agent or employee to become a QED. The referral agent’s QED would then be able to submit background check requests through the BCU and would receive reports from the BCU regarding their applicant’s status. The Background Check Unit (BCU) researches several databases and conducts a weighing test to determine if a person is qualified or not. The BCU will consider the amount of time since an offense or report, the severity of the offense, and any patterns. It is possible to receive a favorable report even if there is a history of potentially disqualifying behavior. When a referral agent begins the registration process, they will receive an email notification regarding the specific process to start the background check. Is there a fee for the BCU background check? No, the Department does not charge a fee for this service. If a referral agent chooses to use a private vendor, any costs or fees associated are the referral agent’s sole responsibility. Each referral agent will have a Qualified Entry Designee (QED), who is authorized to input background request information into the state database. If additional information is needed, and/or a final report is produced, the QED will receive the report. This report serves as evidence that the report is completed, the status of the report, and any additional information that may be required before finishing. Qualifying as a QED will also meet the background check requirements under HB 2661. OAR 411-058-0080 (2) permits a referral agent or an employee to provide referral services if under the supervision of a person who has already undergone a background check through the BCU, pending a final report. Once that final report is issued.This report would determine if the referral agent or employee would be able to continue providing referral services.